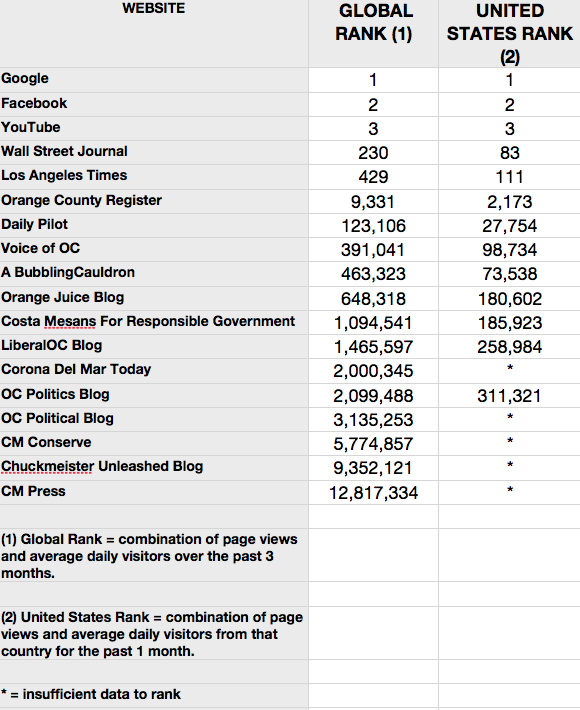 In a recent post another Costa Mesa-based blogger made mention that a site he follows is ranked high on scale provided by Alexa, so that got me thinking about my site and others around the area. Alexa, HERE, is a site that analyzes web sites - blogs and the like - and does a calculation to "rank" them both from a global standpoint and when comparing them to the countries in which they originate. So, I did some research, slammed it into a little spread sheet and now present it for your viewing pleasure. The information surprised me. I listed these sites by "Global Rank" since some didn't have enough data to produce a number in the "United States Rank" column. The calculations were taken from the site today. Crazy as it may sound, I have never, nor will I ever give the OC Register a penny. I would pay for your Blog. YOU are basically neutral. Your readers are biased, but your stuff is real, and that's what counts. Hey, I go to Dennis's blog and post, now and again, just so he won't feel lonesome. Once in a while, I look at MM's blog, but leave when I start feeling soiled. Glad to see you doing so well, Geoff. It bodes ill for the current council majority, and the vote-of-confidence that the charter will be, and that, in my opinion, is a good thing. But seriously, congrats. Content is king. You'll note that I avoided editorial observations.. ;-) I'm impressed and amused that your CM4RG site is ranked significantly higher than many other local sites. As you said, content is king. You consistently produce content that is worth reading - quality, not quantity. Kudos for that. Chuck, my worn out shoes fare better than his blog.